Independent Living is a philosophy and a movement of people with disabilities who work for self-determination, equal opportunities and self-respect. Independent Living does not mean that we want to do everything by ourselves and do not need anybody or that we want to live in isolation. Independent Living means that we demand the same choices and control in our every-day lives that our non-disabled brothers and sisters, neighbors and friends take for granted. We want to grow up in our families, go to the neighborhood school, use the same bus as our neighbors, work in jobs that are in line with our education and interests, and start families of our own. Since we are the best experts on our needs, we need to show the solutions we want, need to be in charge of our lives, think and speak for ourselves - just as everybody else. To this end we must support and learn from each other, organize ourselves and work for political changes that lead to the legal protection of our human and civil rights. Traditionally, persons with disabilities have been seen as medical cases and objects of charity and care, pity and protection. These wide-spread attitudes have been obstacles for disabled persons on their way to self-determination, self-representation and full citizenship. As long as we regard our disabilities as tragedies, we will be pitied! As long as we feel ashamed of who we are, our lives will be regarded as useless! As long as we remain silent, we will be told by others what to do! What is Independent Living Philosophy (ILP)? The start of the Independent Living Movement coincided with the social awareness and rights equality revolution during the 1960’s and 70’s. This rights-based upheaval promotes equality for all without discriminating any sector of the society (i.e. gender, race, age, and presence of disability). What matters is one’s way of life! “Independence means seeking to live in one’s own way through self-selection and self-determination with self-responsibility”. An act providing for the rehabilitation, self-development and self-reliance of disabled person and their integration into the mainstream of society and for other purposes. "AN ACT TO ENHANCE THE MOBILITY OF DISABLED PERSONS BY REQUIRING CERTAIN BUILDINGS, INSTITUTIONS, ESTABLISHMENTS AND PUBLIC UTILITIES TO INSTALL FACILITIES AND OTHER DEVICES." Available services or programs from the government both local & national. means that for a pwd to accomplish tasks, he delegates them or receives assistance from the personal assistant. "Personal" connotes that the assistance has to be customized to the individual's needs. 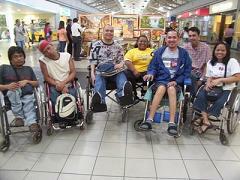 Peer counseling is counseling provided by disabled persons to support disabled persons’ independence. It includes not only the acceptance of disabilities but also information exchange, support and referral activities related to a consumer’s rights as members of the society and civilians. Empowerment on physical side thru independent living skill training program. If pwds want to design services which get them closer to the goal of equal opportunities, pwds have to find expressions for these services which portray them as responsible and capable citizens who are in command of their lives and not as passive objects. Language both influences and reveals attitudes including our own attitudes towards ourselves. A positive attitude and self-image are vital factors for PWD’s not just to ignore but to stand up against discriminatory attitude, remarks and barriers. This constitutes part of public education. 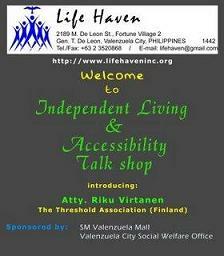 Life Haven is a member of the Asia-Pacific Network for IL Centers (APNIL) (www.apnil.org), Philippine Council on IL (PCIL) and an associate organization of Asia Pacific Development Center on Disability (APCD) (www.apcdproject.org). 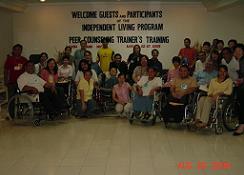 August 2005, Peer Counseling Leadership Training was held in Cebu attended by members of SCIF, HACI Cebu, HACI de Oro and Life Haven.